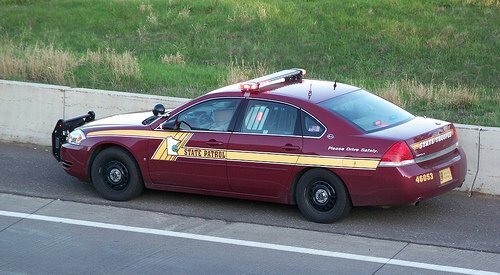 New for 2000, the Chevrolet Impala was actually designed from the ground up as a police pursuit vehicle and adapted for public use; quite the opposite of most police vehicles. From 2000-2005, the Impalas were equipped with a 3.8 liter MPFI V-6 with automatic overdrive transaxle. 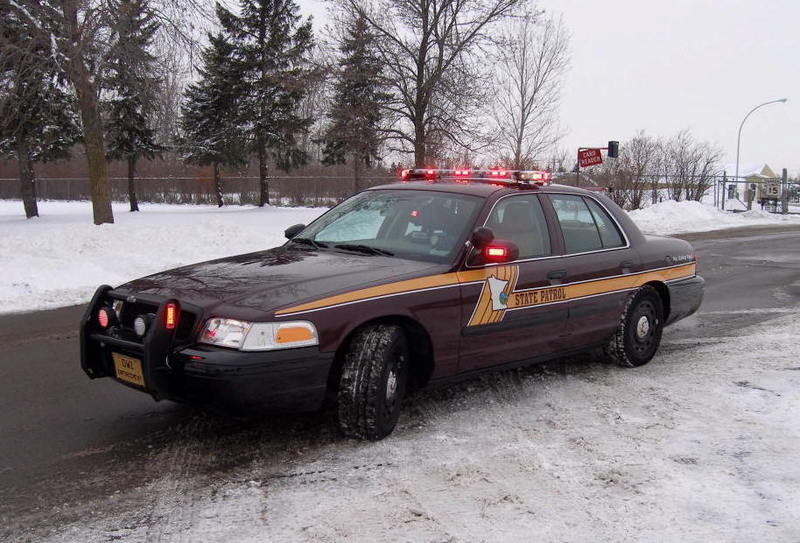 While there were several front wheel drive administrative cars and test cars in the MSP fleet, these were the first front wheel drive units to become part of the regular patrol fleet. 2001 Ford. Photo courtesy of K. Klawiter #120. 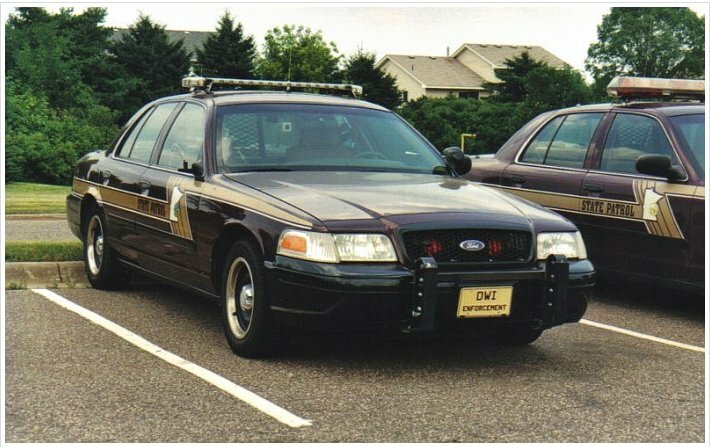 Though subtle, the 2001 model year brought a few more changes for the CVPI, including removal of all trim on the plastic bumper pieces and a new honeycomb-style flat black grille. The rear defroster switch was relocated from the left side of the instrument panel to a spot adjacent to the heater controls. I'm sure that added to the performance in some way. The 2002 CVPI was largely a continuation of the 2001 model. 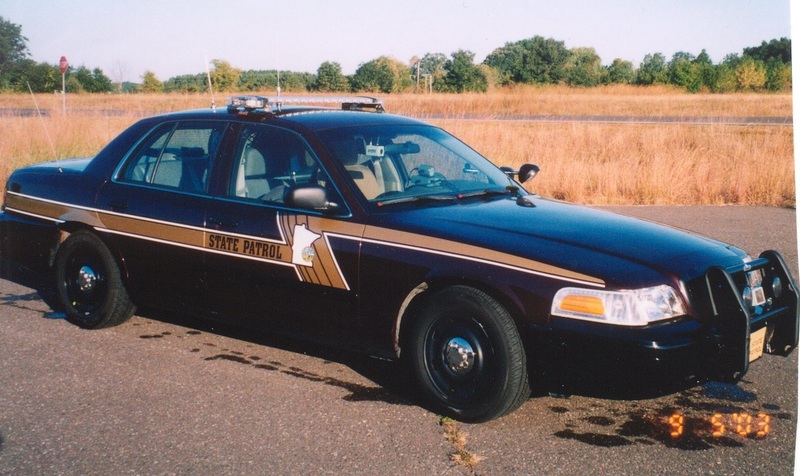 In 2003 Ford did quite a few modifications to the CVPI including interior upgrades, electrical upgrades, all new suspension, steering, brakes, and some minor exterior cosmetic changes. The new 16" wheels have a different look, too, with an offset that makes the wheels appear flat. For all of you fans taking notes, 2003 would be the only year the cars had the flat wheels and still used metallic gold (non-reflective) graphics. The 2004 Chevrolet Impala continued to run the 3.8 liter corporate V6 and a 4-speed automatic transaxle. 2004 Chevrolet Impala. Photo from the M. Wedin Collection. 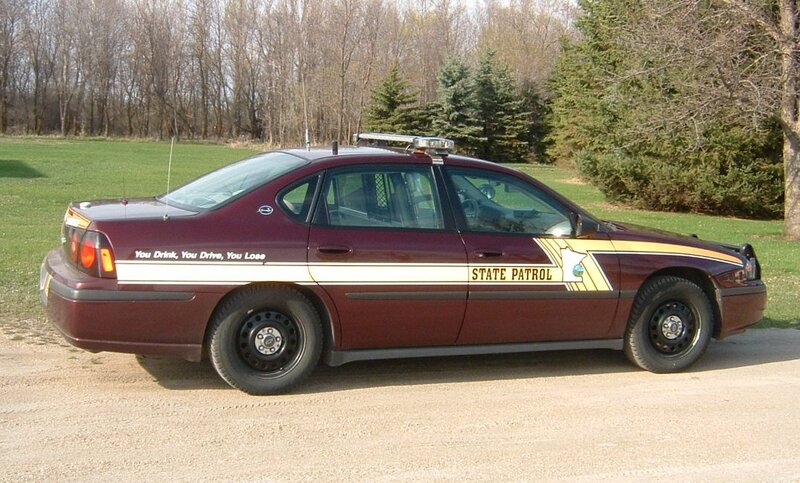 For 2004, although the Ford CVPI remained virtually unchanged, the State Patrol graphics made another change. The gold stripes changed to a little brighter colored fully reflective material, safety slogans were added to the rear quarter panels and a newly designed deck legend was added. All units displayed a special license plate to commemorate the State Patrol's 75th Anniversary. A revised air intake system resulted in an increased horsepower rating of 250. 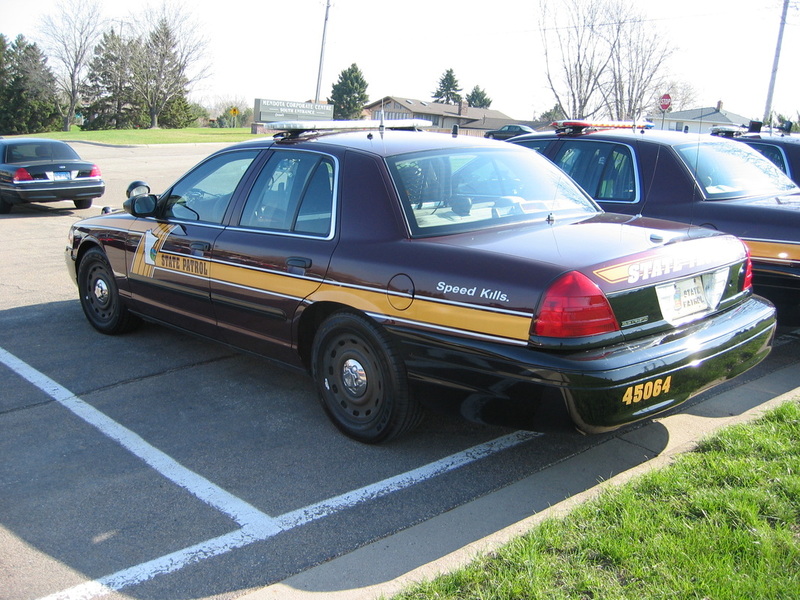 Visually, there was little difference between the 2004 and 2005 CVPI. Mechanically, the throttle body, previously cable actuated, was upgraded to an electronic drive-by-wire system. 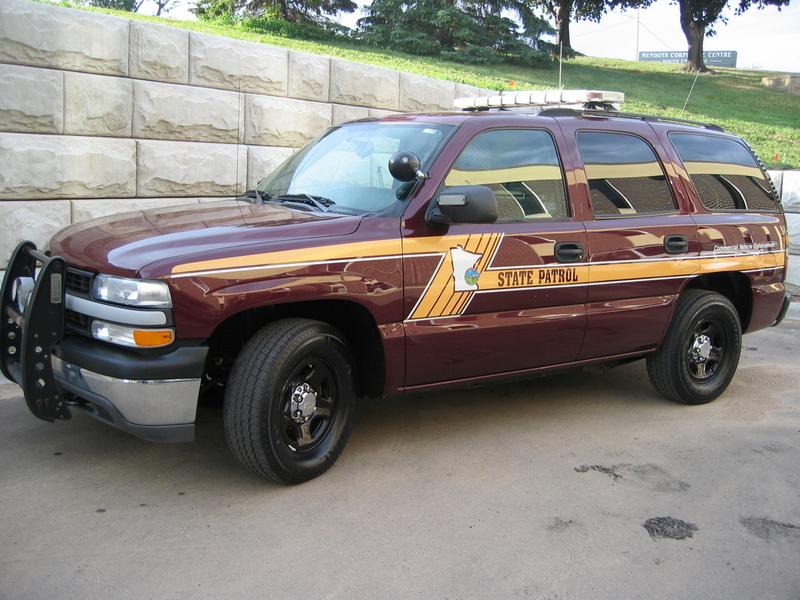 2005 marked the return of the Chevrolet Tahoe PPV, the only pursuit rated SUV on the market. 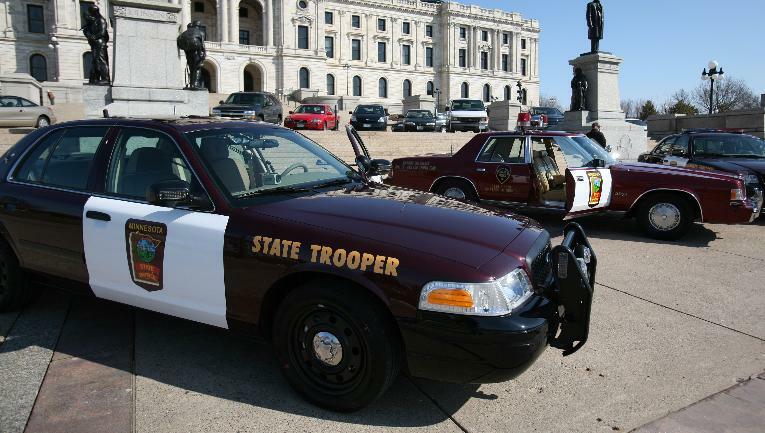 The State Patrol Commercial Vehicle Section had 28 of them in their fleet and there were several more assigned for K9 and safety education use. They used the 5300 V8 and a 4-speed automatic transmission, mated to 3.73 gears. 2006-2009 Chevrolet Impala. 3.9 liter SFI V-6 rated at 233 hp @ 5600 rpm and 240ft-lbs @ 4000 rpm, automatic overdrive transaxle with 3.29:1 ratio. The 2006 models were Sport Red. It was a stretch to call them maroon. 2008-2013 models were only unmarked as no maroon variant was available from Chevrolet these years. On the inside, the 2006 sports a redesigned instrument cluster that includes an analog speedometer, tachometer, and a digital odometer with hour meter and trip meter features. The most notable changes to the 2007 models were the 17" wheels with a more traditional offset and the lack of safety slogans applied to the flanks. 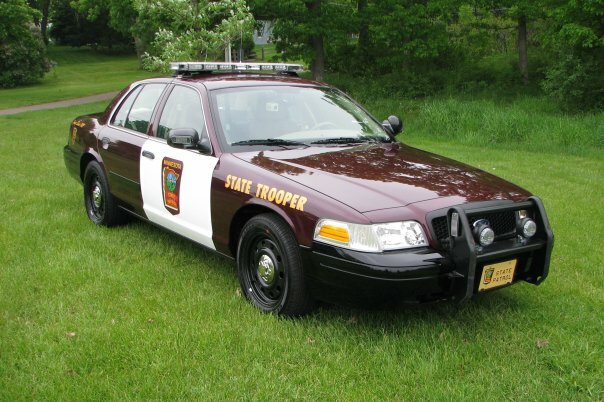 The MSP had some cars with tan interiors and some with grey. 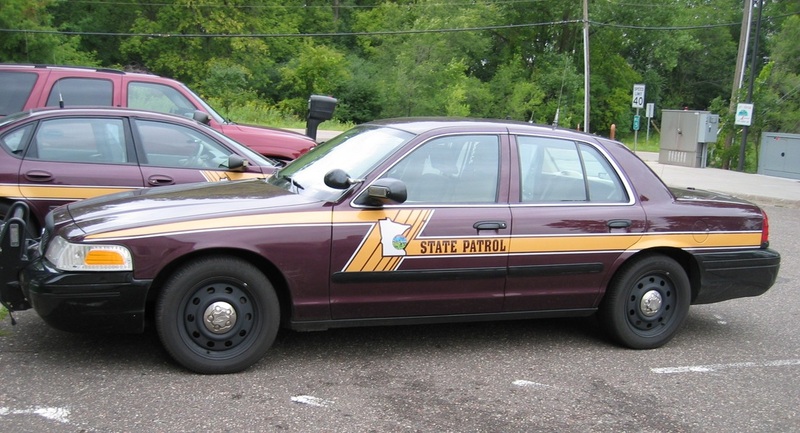 Other than a paint color that was more what it should be on a Minnesota State Patrol car, the 2007 Impala was pretty much identical to the 2006 models. 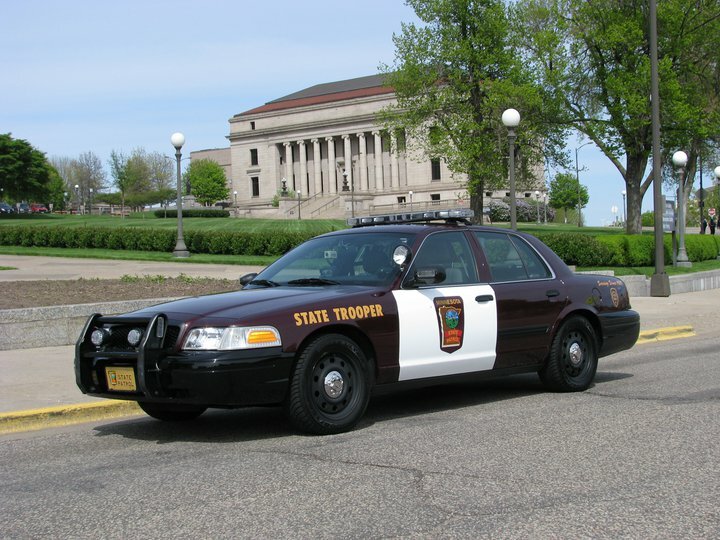 March 27, 2008 – The Minnesota State Patrol unveiled to the public its retro graphics design. The throwback design recalls the white door paint scheme of 1960 through 1991. The idea was to make the units stand out from the crowd. 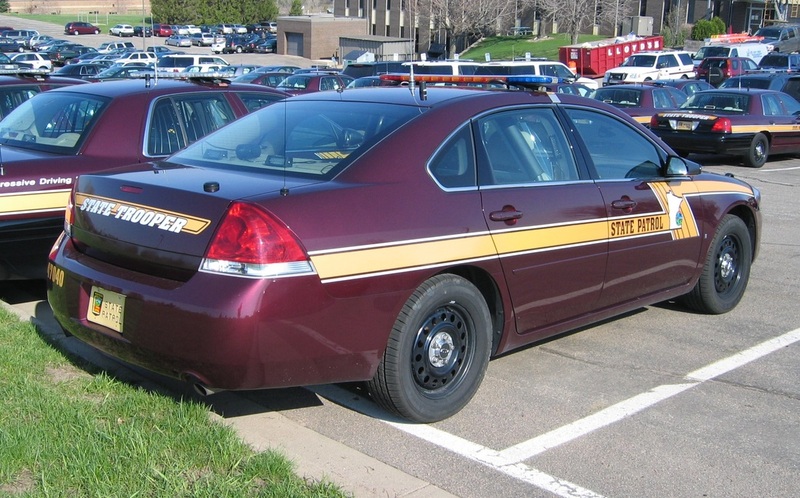 After developing a few different designs with Advanced Graphix of Vadnais Heights, MN, State Patrol staff and equipment committee members chose to hold true to the State Patrol traditions with this graphics package. Although everyone knew the demise of the CVPI was imminent, Ford continued to re-engineer and improve the car. For 2009, side impact air bags, adjustable pedals and recessed window switches became standard. A Flex-Fuel badge added on the right rear is the only observable exterior difference from 2008 models. Many of the operational districts were assigned a single unmarked Dodge Charger, each one a different color. This red one was assigned to the West Metro district. 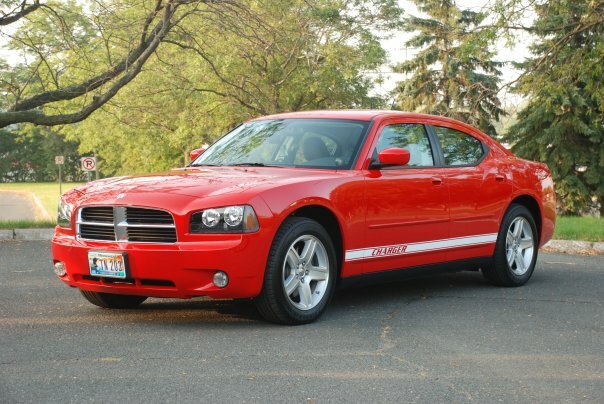 Though badged as an SXT, it is indeed Hemi-equipped. A Charger aficionado would recognize the significance. Although the end was fast approaching, Ford continued to re-engineer the Crown Vic throughout the first decade of the 21 century, making subtle ergonomic changes, numerous chassis refinements and continuing to enhance the dependable 250 hp 4.6 liter V8. The production code was changed from P71 to P7B.